The major objective of this report is to analysis Credit Related Activities and Recovery of Prime Bank Limited. General objectives of this reports are analyze portfolio of credit disbursed, the current credit product portfolio, credit assessment, approval and disbursement procedure. Here also focus on the current position of PBL (Hajiganj Branch) in comparison with other similar private commercial banks. Finally this report make swot analysis Credit Related Activities and Recovery of Prime Bank Limited. Banking concept has been evolved since the rapid development of Information Technology. Nowadays almost all over the world banking concept is a well-orchestrated name which has indeed added a new feather to the gamete of banking lexicon. The primary activities of any bank are to collect deposit and invest in different areas to earn profit. Beside this, the asset value maximization of the shareholders and maintaining strong clientele are another two important duties for any bank. To maintain these, Prime Bank Limited (PBL) has reached a vast amount of Tk. 106956.27 million balances during 2009 with a 22% growth rate over the year 2009 (Annual Report, 2009).This large amount has been invested in different purpose to provide industry loan, export-import finance, commercial lending, house-building finance and others. From the very beginning, the credit exposure of PBL has been focused on commercial lending that is international trade Finance, domestic trade finance, contractor/supply finance etc. But from the annual report (2009) of PBL, it has been revealed that the total loan amount Tk. 89252.22 million . One of the prudent conditions of ensuring profit is to minimize risk. Such defaults by one of the corporate clients and the adverse effect of political situation at the end of 2009 have made the bank management to rethink about its existing credit portfolio with an emphasis on credit. the current position of PBL(Hajiganj Br) in comparison with other similar private commercial banks. 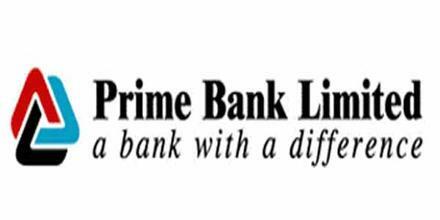 Prime Bank Limited, a scheduled bank, was incorporated under the Companies Act 1994, and started its operation on April 17, 1995 with the target of playing the vital role in the socio-economic development of the country as well as earning profit. It was registered as a banking company under the Bank Company Act 1991 from the Bangladesh Bank on February 12, 1995. The bank started making profit from the year of its inception. The first Managing Director, Mr. Lutfar Rahman Sarkar, Ex-Governor, Bangladesh Bank, provided required leadership for a newly established bank. Prime Bank Limited is a second – generation private commercial bank has been working for stimulating trade and commerce, accelerating the pace of industrialization, boosting up export, creating employment opportunity, alleviating poverty, raising standard of living of the people etc and thereby contributing to the sustainable development of the country. At present, the bank has a network of 89 branches with around 2280 employees stationed in both rural and urban areas of the country. Since inception, the Bank has been making significant profit every year and positioning itself as second highest profit-making bank in the country for last five consecutive years. This has been possible due to significant growth of the bank. This has also been possible due to minimize the risks of the bank successfully. Vision: To be the best Private Commercial Bank in Bangladesh in terms of efficiency, capital adequacy, asset quality, sound management and profitability having strong liquidity. Continuous improvement in our business policies, procedure and efficiency through integration of technology at all levels. When a loan has been taken by a person from a bank then he has to repay it according to the EMI fixed by the bank. Recovery of advances is one of the most important activities of the bank. Bank can not sit ideal after sanctioning advances. First of all, secure the advances by obtaining suitable securities followed by constant supervision and follow up. if necessary, they also nurse sick project and business. All thinks are done in order to recovery to ensure recovery. Deposit all conceivable efforts; recovery remains a constant worry for the banks. This worry forces the bank to ensure regular repayment of both the principle and interest. If it is an one time loan, bank’s worry is over as soon as the repayment is made in full. But if it is a continuous loan like Castle credit or over draft, repayment is often followed by regular renewal of the sanctioned limits. In such cases bank even enhance the limits, if need. So far good. But the problem start as the borrower became unable to pay either regular installments or suspends payment as required. At such happening starts the second stage of recovery. This is normally done by rescheduling the payment schedule. Rescheduling is, however, subject to deposit of a specified amount of the advance and various other Central Banks’ restrictions. Rescheduling is not in the truest sense of the term cash recovery. It is in fact lengthening the contracted period of repayment. Normally banks reschedule advance of problematic nature even by waving a part of interest. This is done with a view to giving chance to the industry and business to improve so that the advance becomes regularized and banks can avoid keeping provision because of classification. Despite all this steps, advances become stuck up showing no signs of normal recovery. As per rules of the central bank advances at this stage automatically become classified banks, therefore, have to file court cases for recovery in terms of the money lone court cases for recovery in terms of the money loan court act-2003 as per provisions of this act they can sell of the securities for realization of the dues and go to the court of recovery of the residue if any. There may, however be mutual settlement between the borrowers and bank through the court. There may even be settlement between them under intimation to the court. In view of the huge classified loans and court cases numbering thousands in this regard, the problem of recovery has in the meanwhile become acute. Banks have been facing too many problems in tackling the issue with normal administrative and legal set up. Considering the inadequacy of the recovery arrangement within the banks and inadequacy of skill, Central Bank has recently allowed the banks to avail of the services of specialized institutions called `asset management company` or recovery agency. These are the institutions recently set up with specialized knowledge in handling recovery cases either through administrative or legal steps. For purchasing of non-commercial, new and reconditioned vehicles, this loan is given for personal use of the individual. Loan amount(Max) Tk 20, 00,000 or 90% of the vehicle price. Tenor 6 years (max) for brand new cars and 5 years (max) for reconditioned car. Disbursement mode Pay order directly issued in the name of respective car company. Criteria for application(Age limit) Any Bangladeshi citizen of 25-60 years at the time of maturity of loan. For purchasing household durables like television, refrigerator, air-conditioner, washing machine, computers and other household furniture for personal use, any individual can apply for this loan. Loan amount(Max) Tk 5, 00,000 or 90% of the vehicle price. Disbursement mode Pay order directly issued in the name of respective company of purchase. Risk fund 1% on loan amount. Criteria for application(Age limit) Any Bangladeshi citizen of 21-60 years at the time of maturity of loan. Disbursement mode Savings account of clients or sometimes cash disbursement. Criteria for application(Age limit) Any Bangladeshi citizen of 25-65 years at the time of maturity of loan. Loan amount(Max) Tk 5, 00,000 for general practitioners. Minimum service length For salaried individuals, must be confirmed of an established organization. For self employed person, a professional experience of minimum 2 years is required. For educational purposes like study in abroad or within the country, this loan is given. Loan amount(Max) Tk 5, 00,000. Tk. 10,000 for Govt., Semi-Govt and autonomous bodies employees. Loan Amount(Min) 8 times if gross salary where the organization of the applicant would have Memorandum of Understanding with PBL subject to highest Tk. 3, 00,000. Disbursement mode Clients savings account or sometimes cash disbursement. Criteria for application (Age limit) Any Bangladeshi citizen of 21-65 years at the time of maturity of loan. Loan amount(Max) Tk 2, 00,000. Disbursement mode Clients’ savings account or sometimes cash disbursement. Loan Amount (Max) Tk 5,00,000. Disbursement mode Clients’ savings account .In case of salaried individuals, sometimes cash disbursement may happen. Criteria for application(Age limit) 25-65 years at the time of maturity of loan. The purpose of giving this loan is to purchase apartment/house(if old, not older than 10 years), constructing new house and taking over of house-building loans from other banks/non banking financial institutions. 50% of purchase price of old apartments/home subject to maximum Tk. 50, 00,000. Minimum Monthly Income The quantum of loan shall be such to ensure monthly installment size would not exceed 40% of the gross income or 80% of the residual income after deducting all expenses except present rental expenses whichever is lower. For any retail loan application, Tk. 500 is taken as a fee. To apply for any of the above retail loan of PBL, a client needs his/her photographs, copy of passport/ID card, last one year’s bank statement, copy of TIN, trade license(for businessmen), personal net worth statement etc. One of the special criteria of retail credit or consumer credit is that, it is an unsecured loan as there is no requirement for collateral except letter of guarantee. Besides these, following legal documents are needed to get any retail credit from PBL. Letter of offer with full terms and conditions stated therein and duly accepted. The prior condition for any credit disbursement is to critically assess and approve the credit proposal that is the client selection and assessment. In case of retail credit it should be done more crucially as retail lending is one of the types of unsecured individual lending without collateral. The primary factor determining the quality of the Bank’s credit portfolio is the ability of each borrower to honor, on timely basis, all credit commitments made to the Bank that is, repayment of loan installment on time. In PBL, more emphasis is given on repayment potential of loans out of funds generated from borrower’s business (cash flow) instead of realization potential of underlying securities while assessing a retail credit proposal. Following are the steps that are maintained in PBL for assessing any retail credit proposal. Basically, branches receive the client application with other required papers necessary for different retail loans. Bank statement and other income documents verification. In most of the times, CPV is done by branch managers. CPV is done by third party agency also to enable the client selection of better accounts for accelerated processing and quick rejection of those having negative/inadequate information. Retail credit officers then verify data collected by third part. Existing guarantor of any other loan of the bank will not be accepted as other guarantor for other loans. Any existing borrowers will not be taken into account as a guarantor for any other loan. Guarantee from the Chairman, Managing Director and Directors of Corporate facility clients and obtaining will be allowed after the prior approval of Head Office. All guarantors will be verified whether they have any relationship with banks earlier with either positive or negative status. All approved applicants are checked against Bank’s database to identify whether the applicant is enjoying any other loan in other accounts part from the declared loans. Whether the client has any other loan with any other bank is also important to know for client selection. In this case, CIB (Credit Information Bureau) are sent in a specific form to Bangladesh Bank. Within the time of the CIB returned back to the branch, the retail credit officers of the branch make a credit proposal for further assessment and approval CIB reports are requested for any amount equivalent to Tk. 50,000 and above that. After returning the CIB information, the credit proposal along with documents is sent to Retail Credit Head Office (RHO).Up to this point at branch level, almost seven to ten days are required for processing. The assessment method can be divided in two steps. The first step is known as “Credit Scoring” which is done to predict the creditworthiness of applications. A prior designed excel sheet is there to score in point values of some important aspects of clients such as occupation, residence status, income details etc. The total of these point values in 100 points represents the repayment probability of that particular client. The higher the value, the probability of getting approval for credit is higher. The second step is known as “Judgmental Decision”. Application meeting the minimum cut-off score and meeting other criteria is further reviewed for judgmental decision. After credit-scoring method is completed, all the credit proposals are presented in the board meeting for approval. The judgmental approval involves the assessment of an applicant’s character, capacity and collateral. After presenting the credit proposals, the authority critically analyze the aspects and after that, the authority finally decides about the credit sanction. The members of the authority have some individual delegation power of credit, which is limited by Tk. amount. Up to this point, three to four days are required for processing. The process, procedures and policies maintained by the Prime Bank Ltd. is also fallowed by its Hajigong Branch for the allocation, distribution and disbursement of loans. But the volume of transaction in these aspects is little compared to other branches in the capital and other divisional and district-level branches. Description: Corporate credit status of Prime Bank Limited Hajiganj Branch is shown in the above figure. According to the figure, highest number of clients was found in SOD (EM) and a lowest number of clients were found in Bank guaranty. Description: Status of loan amount which provided through Prime Bank Limited Hajiganj Branch is shown in the above figure. According to the figure, highest amount of loan was found in SOD (General) and a lowest amount was found in SOD (EM). Description: Status of retail credit Prime Bank Limited Hajiganj Branch is shown in the above figure. The figure revel that, the highest number of retail loan was found in HHD and the lowest number of retail loans was found in car loan. Status of Retail Credit amount of Prime Bank Limited Hajiganj Branch. Description: Status of Retail Credit amount of Prime Bank Limited Hajiganj Branch is shown in the above figure. From the figure shown the highest amount of retail loan was found in House loan and a lowest amount was found in Staff loan. Description: Present overdue status of Retail loan in context of PBL Hajiganj Branch shown in the above table. According to the table, highest number of overdue clients and amount was found in HHD and the lowest overdue client and amount was found in Car loan, Doctors Loan and Staff loan respectively. Description: Comparison between Prime Bank Limited and City Bank Limited Hajiganj Branch in context of corporate credit has been shown in the above table. Table reveals that PBL corporate credit amount is Tk. 194 lac on the other hand City Bank Limited still did not disburse any corporate loan. Comparison between Prime Bank Limited and City Bank Limited Hajiganj Branch in context of Retail Credit has been shown in table. According to the table, total amount of retail credit of PBL was found Tk. 643 lac and total amount of retail credit of City Bank Limited was found Tk. 620 lac. When asked about the credit facilities of Prime Bank, Hajigong Branch, almost all of the respondents expressed their satisfaction over the performance of the people serving there as well as the facilities provided to them by the said branch. But they regretted the facts there are not sufficient packages and new facilities to be provided to the people of that locality. Most of the people who want credit facilities they don’t want to provide necessary documents and information in time which are most required for credit facilities. For the compliance of prudential guidelines of Bangladesh Bank, 2004, PBL asks for CIB report for an amount of TK. 50,000 and more. As it takes six to seven days for CIB to be returned back to the branches, almost 15-20 working days are needed by PBL to disburse credit. Now days, people are too busy to spend longer time for having a smaller amount of loan for their personal need. For this longer assessment process that is widening the time interval between a loan application reception and loan disbursement has resulted less number of clients and has also affected the interest income. PBL currently is allowing retail credit disbursement to a few individuals who are businessmen. Again, salaried individuals are getting preference in terms of retail credit. Though the numbers of fixed income earning people are increasing day by day, there is an existing large segment of business people of different types in Bangladesh who needs retail loan frequently rather than salaried individuals. Also, the self-professionals related to the legal activities and media are not there in the target clients segment. This narrow focus on target clients is reducing the market share of PBL in retail lending. The credit disbursement process of Prime Bank Ltd. is decentralized which is also a barrier for it to take steps for more expansion in credit. As the credits disbursed from branch level, most of the employees of credit department in branches are engaged with disbursement related activities in most of the times which hampers the branch activities to attend more clients. PBL has currently direct sales agent (DSA) and paper advertisement only this two medium for frequent promotional activities in credit. Sometimes it arranges fair for credit. In the present perspective, multimedia activities have expanded in such a way that, larger number of people watch television and listen radios rather than reading newspaper. People are also attracted by colorful billboards in the road. PBL has taken no steps for promotional activities up to now in display media and so on which can also be a cause for having lesser market share than the competitors. PBL currently has diversified product portfolio. From the above comparison, it can be easily observed that, the other immediate major competitors Bank have only few numbers of products and with these products, they are trying to capture middle-class, upper middle class and upper class people’s personal credit need. But Prime Bank has separate cells for separate client segments which are one of the most important aspects of PBL. This is one of the crucial prospects for PBL to proceed with credit further. It can be said confidently from the above comparison that, PBL has the lowest interest rate in terms of all credit products among its competitors which is an opportunity for it to attract new clients. Again, in terms of processing fee, stamp charge and early settlement cost, wherein its other competitors are taking higher amount and charges for early settlement, PBL charges the lowest amount and allows its client for early settlement at free of cost, which is convenient for clients. In some products, PBL offers different lowest amount and time interval as a minimum which is also a convenience for the clients of a developing country like Bangladesh. In Bangladesh, most of the fixed income earning people has income range within Tk. 20,000-35,000. For them to avail an amount of retail credit for more than Tk. 10,000-12,000 to fulfill personal needs is almost impossible. Lower tenor of credit lessens the burden from clients and inspires them to take more credit which is currently offered by PBL. As PBL asks for CIB for any amount of TK. 50,000 and above, it protects PBL of holding default clients and secures the income generated by credit. The defense people, lawyers and journalists are not in the current target clients’ list of PBL, who if were in target segments of PBL, could add more wings in market share and interest income also. As there are already more diversified credit products, PBL should rethink about its target client segment and if possible, should include defense people, lawyers and journalists that can easily fit with that products. PBL should consider especially of businesspersons. PBL management should take care of its IT development. If there is an online system between Credit Head Office (CHO) and branches, the applications along with necessary documents will be able to be transferred in short time and with less costs for assessment into the CHO. It will also reduce the disbursement time interval and PBL will be able to get more clients. PBL has currently decentralized credit disbursement system which is requiring more time for even any small amount of loan. In this case, PBL should develop a central database system which will enable the CHO of PBL to disburse any amount of credit directly from Head Office. It will not only reduce the loan disbursement time interval but also helps branches of PBL to be more client oriented. This central database system will also enable CHO to identify any credit client of any branch at any time, which will ensure highest level of monitoring and quality control. PBL management should take more steps to promotional activities. Television advertisement, creating billboard, recruiting more sales agents and arranging loan fair can add a large opportunity in achieving more market segments. In the credit facilities credit lending has been a spectacular innovation in the private commercial banking sector in recent years. The growth of lending, especially, in a developing country’s economy, is attributable to the rapid advances in information technology, the evolving macroeconomic environment, financial market reform, and several micro-level demand and supply side factors. In today’s Bangladesh banks, especially, the private commercial banks consistently point to the stability of revenue and profit as the most important feature of lending and a key motivation for the recent interest. In particular, credit stability is seen as valuable for commercial banks seeking to offset the volatility of riskier business lines, such as trading and other capital-market activities. From the above analysis and comparison, it has been proved that, though Prime Bank Ltd. has some problems, yet it has lots of opportunities to carry on its corporate & retail lending business. Diversified product portfolio, lower rate of charges etc is the favorable features of PBL for clients. If, Prime Bank Ltd. follows the above recommendations, to cope up its problem, Prime Bank Ltd. will be able to continue to chart in this traded path.